Green-Crafts.com is a community focused on crafts & projects which are green, sustainable and eco-friendly. Jump into our articles, dive in the discussion, and share your own ideas: Welcome! Amber is a natural, prehistoric polymer – amazing, mysterious and beautiful. The amber of today was formed millions of years ago from the pine trees resin, which hardened and fossilized over thousands of millennia. This resin was secreted by the amber trees Pinus succinifera in reaction to tree wounds and pest invasions, in order to heal and protect itself. The resin promoted regeneration of the tree tissue and had antimicrobial and antifungi properties. 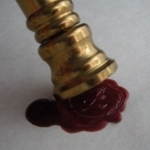 If you’ve ever been fascinated by calligraphy, stationary and the old times, then you might already be familiar with wax seals. Applied to paper, parchment or envelopes, they represent mystery and aristocratic elegance.